Juan was born in the small town of Despatch, about 30km from Port Elizabeth, South Africa. His love for diving can be traced back as far as 1980 when during the great flood of that year Juan was snorkelling in the back yard under the orange tree whilst his parents were evacuating their home. In 1993 he completed his first SCUBA course. In 1994 he received his Bachelors degree from the University of Port Elizabeth. The sea always beckoned and in 1999 he became a PADI Dive Master. In 2000 he successfully completed his NAUI Instructors Course. He went on to complete his skippers’ course in 2002 and his PADI Open Water Instructor course in 2004. Juan has to date more than 3000 hours in charge of a vessel and has done more than 2000 dives on the reefs of Port Elizabeth. For all the years spent diving, it was only after he bought his first underwater camera that his passion for all the livings creatures in the sea started. Whilst diving with camera in hand looking for that “perfect shot”, his curiosity was sparked by all the small ceatures he’d not paid attention to before. Trying to identify them led to frustration, due to the lack of published information on the reefs and its inhabitants along the Port Elizabeth coast. This was the motivation for the development of www.easterncapescubadiving.co.za. Juan has done numerous dives abroad and along the South African coast but considers Port Elizabeth his favourite dive spot due to the diversity of the reefs. He is now a qualified RAID Instructor as well. 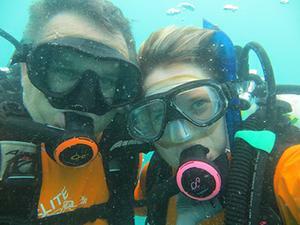 In 2004 she completed her NAUI Open Water Instructor course to share her passion with others. Since then, while studying she also obtained her Qualification as a PADI Open Water Instructor and specialities such as Naturalist, Wreck, Photographer, Nitrox diver, just to mention a few. 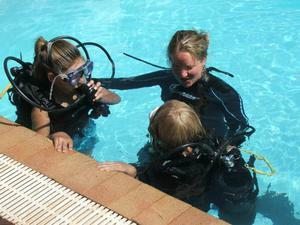 In 2009 she obtained her qualification as a SSI Dive Control Specialist Instructor. She also obtained her skippers licence in 2010 to add to her list of qualifications. She has now also completed her RAID Instructor course as well as her Commercial diving licence.